Yury Debelyak. Yakby Meni Cherevychky (*I wish I had the shoes). Yury Debelyak. 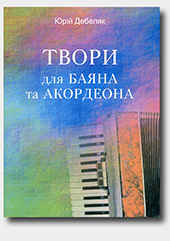 Yikhav Kozak Za Dunay ("Cossack rode beyond the Danube"). Yury Debelyak. Po Sadochku Khodzhue (*I'm walking in a garden). Yury Debelyak. Posylala Mene Maty (*Mother asked me to weave a carpet). Yury Debelyak. Yshla Divchyna Luchkamy (*A Girl was Walking in Meadow).